Pheasant Wings -- 6 Pack. $9.99. Great wings. Puppy knows just what they are. "Wings were fresh and well sealed." Wings were fresh and well sealed. I'll buy them again. "It's a great training item that all bird dogs need." Zack (the puppy) is real interested in stocking the wings on the end of a fishing line or tied to a bumper. It's a great training item that all bird dogs need. "My pup loves the wings." My pup loves the wings. He's already 12 weeks and points and flushes which he tends to like to do a little more at this point, but we'll get it down. "Work great for training my pup." Pheasant wings are just what I wanted. Work great for training my pup. "Our puppy loves the wings." Our puppy loves the wings. He is retrieving the dummies with the wings attached and is able to trail the scent through our yard. "This product exceeded our expectations." This product exceeded our expectations. Great for training, and we are having great success! "This was a great and efficient transaction." This was a great and efficient transaction. Will definitely be a future customer. "The wings are great, I work with my dog every night. The dog can't wait to get ahold of the wings." The wings are great, I work with my dog every night. The dog can't wait to get ahold of the wings. These will help me prepare the dog for hunting. "I am very happy with the results so far, especially with the Bloodhound." I use these wings for both my Blood Hound and German Short Hair. I am very happy with the results so far, especially with the Bloodhound. Terriers and Dachshunds. Hunts. Competes. Just perfect. It was a gift for a friend. Couldn't have been better. "These have worked like a champ for the training work we've done so far." These have worked like a champ for the training work we've done so far. I'm sure I will be back for more/other products. All high marks for Gun Dog Supply. "All 3 dogs love finding the wings when hidden for them." All 3 dogs love finding the wings when hidden for them. 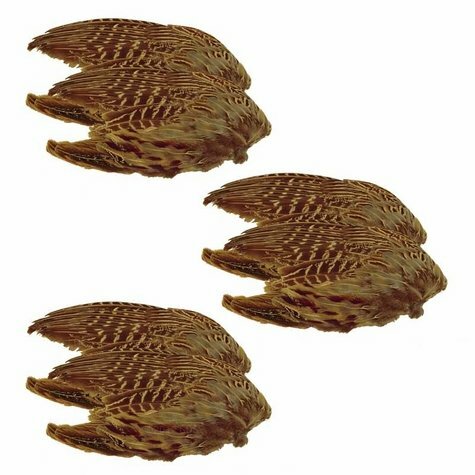 "Our dogs love these wings for Retriever and Waterfowl training." Our dogs love these wings for Retriever and Waterfowl training. Also getting our new Puppy interested in chasing and retrieving. They look great, but I haven't tried them yet. The dog loves them. They have a very good scent. Great price for a training tool. Clean and fresh. Pup loved them. "Great product. More orders for this product will be forthcoming"
Great product. More orders for this product will be forthcoming when my new GSP puppy arrives and begins training. On a side note, Gun Dog Supply has wonderful customer service. Very personable, timely delivery, and everything was packaged well. "I am using these to teach my pup to point, and I am also using them to train my pup to follow scent." My pup loves these. I am using these to teach my pup to point, and I am also using them to train my pup to follow scent on a scent trail and on a dummy for retriever drills. Excellent product. "I wire tie these to canvas bumpers and plant them in various spots on our 20 acre training area." I wire tie these to canvas bumpers and plant them in various spots on our 20 acre training area. My dog is still learning blind retrieves, and the scent helps her home in on the target which builds her confidence. I also use them on marked retrieves which enhances the dogs enthusiasm. "Durable and great training tool." Durable and great training tool. Good price too. "Getting my vizsla ready for her first hunting field day." Getting my vizsla ready for her first hunting field day. The wings are working perfectly for training. Exactly what I needed. Thank you. Great looking wings. Fast shipping. Wings worked very well. This is a great deal! Lab/pointer mix pointing and retrieving at 10 weeks. "Good for getting my pup on real scent." Good for getting my pup on real scent. "Timing - fast, integrity - excellent." Very quick delivery and I overpaid, yet they still returned the additional $$. Quality - good, service - good. Timing - fast, integrity - excellent. I will be back. Tried to order the other stuff from Cabelas at first. It was out of stock, backorder, and higher priced, so I found this guy online. Excellent service. Excellent product. Would recommend him to everybody! "The wings are working great for training." The wings are working great for training. Our door went crazy looking for them. Fresh quality wings. Definitely will purchase more. "Maybe you could add some string as a "freebie" to attach to the wings." Maybe you could add some string as a "freebie" to attach to the wings. Great product. My dog loves them. Outstanding product. My dogs run after these things like the they're real thing. "I am sure the wings will be just fine." I have not received the wings to no fault of Gun Dog Supply. I put in the wrong address and when I called their 1800 number I found out of my mistake. The customer service agent understood and sent them to me again. I really appreciated the customer service. I am sure the wings will be just fine. "Puppy went after them right away." Chesapeake Bay. Hunts. Family pet. Puppy went after them right away. "Product arrived very quickly and were exactly as described." Have never purchased any for comparison. Product arrived very quickly and were exactly as described. Dog was very excited with the wings. They were a little dry but had good scent. He devoured them quickly so buy several for training. Good quality product, nicely packed and delivered fast. I'm satisfied with it, but they don't last very long. Wings contain no preservatives. Packaged in USA.